Here’s a concept layout. 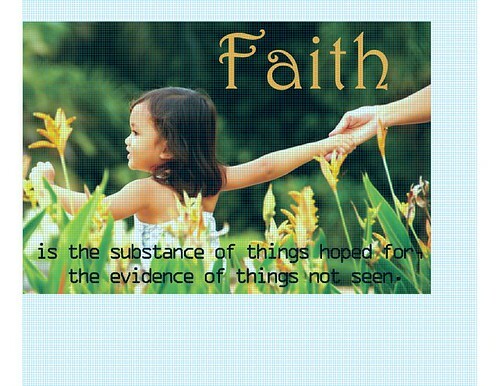 I think this is the photo you liked, and the font for Faith is Harrington. The rest of the quote would be in plain block letters. Hebrews-11-1-Come-v1, a photo by Carmen CS on Flickr. In 20 point, this would be 9″x6″, and is just at the limit of what I think will provide good detail on her face. If you were willing to go finer, it could get smaller or more detailed. Going to a larger size would also allow more detail. Maybe standard letter size, in landscape? Or would you want to keep the book smaller? Hebrews-11-1, a photo by Carmen CS on Flickr. Prayer: Father, we lift Bella up to you. Please be with her, and help her to walk with you. Cat’s Project for Bella – How Much Time? Now that we’ve got the verse for Bella, Cat needs to decide how big a project she wants. One of the first questions that must be answered when starting any design is “How much time do I want to devote to this project?” Time limits many design options. If you want something to give tomorrow, there’s no way a large elaborate design will work. If you want beautiful lettering, an intricate image, subtle shading, you’re not going to get it in a bookmark you can complete in an afternoon. I want to stress here that bigger, time-consuming designs aren’t always better. It can be hard to sustain the effort needed to make it to completion. It is dispiriting to start with high hopes for a project and end up with it sitting half-finished in the closet. It’s best to pick something you can encompass. Might make a nice image for Bella to feel her mom still with her? Maybe superimposed on a sunrise image? Whither thou goest…, a gallery on Flickr. Once I have a verse or two chosen, I start looking for images that work with them. For this, Flicker is a great resource. But remember only to use images according to their licensing. Creative Commons licensed images can be used for personal projects, and many Flicker photographers use it. I like the idea of this image, especially if you have cats. Pick one with a distinctive face, or one that Bella particularly likes, and put something yummy on your fingers so the cat licks them. Get a friend to take a bunch of pictures and I’ll pick the best. This is another neat idea. God is light – taste his beauty! While I’m not sure the guy is right, the idea of not just tasting, but licking up every last bit of God seems yummy! Taste and see that The Lord is good…, a gallery on Flickr. I would like something small she can keep in her room, or in a memory box as she matures. 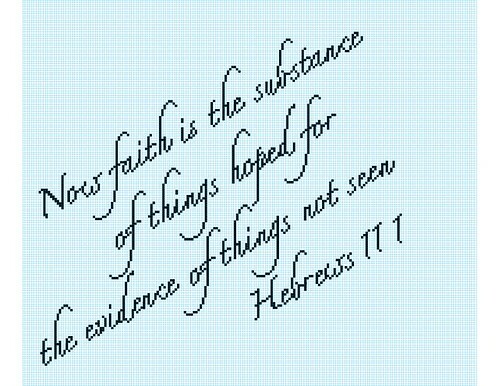 Small size means we need to look at trade-offs between length of verse, simplicity of lettering, and size of stitches. If you’re willing to work very small stitches intricate words are possible, but will take time. Cat, I had an idea which I’m not sure if you would like. How about stitching a book? Maybe a book cover that would hold photo pages. Or maybe a book that you could add to over time, and maybe even other people would stitch pages for her? She might even add to it herself in time. It could be bound with ribbons, and the edges whip stitched. Insp Unfailing BM, a photo by Carmen CS on Flickr. 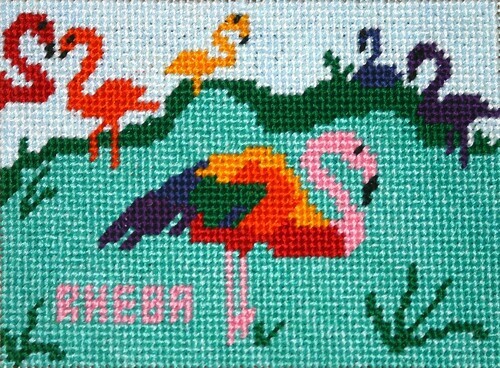 Rheba Flamingoes, a photo by Carmen CS on Flickr. Children Footrace DA Blodget Adoption Picnic August 19, 201010, a photo by stevendepolo on Flickr. which incidentally is my favorite verse. But that’s not Old Testament. I’m praying on this, but I wonder if any of you have suggestions?